Digital devices and online media have become integral to young people’s lives, and have enabled new opportunities for socialisation, creativity, and learning. However, ‘always-online’ lifestyles and the constant accessibility of smartphones and other electronic devices have also led to excessive digital technology use and related mental health issues. At the same time, online activities such as eSports and entertainment streaming have popularised the act of committing to continuous engagement in video-gaming activities for some young people. Australian data on excessive gaming indicate that 4.1% of adolescent boys play video games for an average of 9 hours or more on an average weekday, and 7.8% play for an average of 9 hours or more on weekend days. Further, 4.4% report going without eating or sleeping in order to play games; feeling upset if they cannot play; spending less time with family or friends or not doing school work due to gaming; and trying unsuccessfully to reduce their gaming time. In recognition that some people become problematically involved and a smaller proportion develop an addictive relationship with video games, ‘Gaming disorder’ and ‘Hazardous gaming’ are now officially recognised in the International Classification of Diseases (ICD-11). Online gaming is a complex phenomenon with unique features that pose challenges for researchers, clinicians, parents, and policymakers to develop effective approaches to reduce problematic gaming. 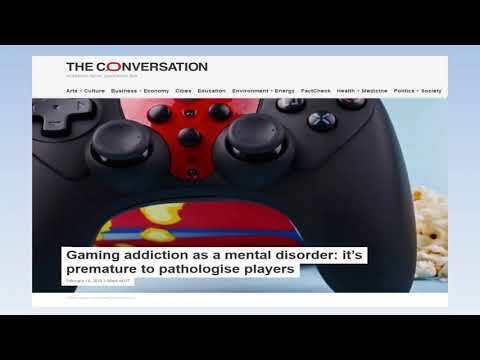 This presentation will discuss some of the latest international research on problematic gaming and gaming disorder. The focus will be on conceptualisation, research on epidemiology and risk and protective factors, and screening and intervention approaches. Kindly hosted by the University of Adelaide, the Academy’s 2018 Paul Bourke Lecture by Dr Daniel King is presented as part of inaugural Social Sciences Week. Daniel King is a senior research fellow and clinical psychologist in the School of Psychology at the University of Adelaide. He was awarded a Discovery Early Career Research Award (DECRA) from the Australian Research Council in 2016 to study maladaptive online gaming. He has published more than 100 peer-reviewed publications and the first book on DSM-5 Internet gaming disorder. His research examines digital technology-based problems, with a focus on online video-gaming and online gambling among young people. He has been a consultant on these issues for national and international authorities, and was a member of the World Health Organization (WHO) Advisory Group for ICD-11 Gaming Disorder. Bookings Essential via RSVP button above.